This review reflects our experience in November of 2012. Aloha kakahiaka and good morning! Today we’re taking a detour across the country (and the ocean) to Aulani in Hawaii. 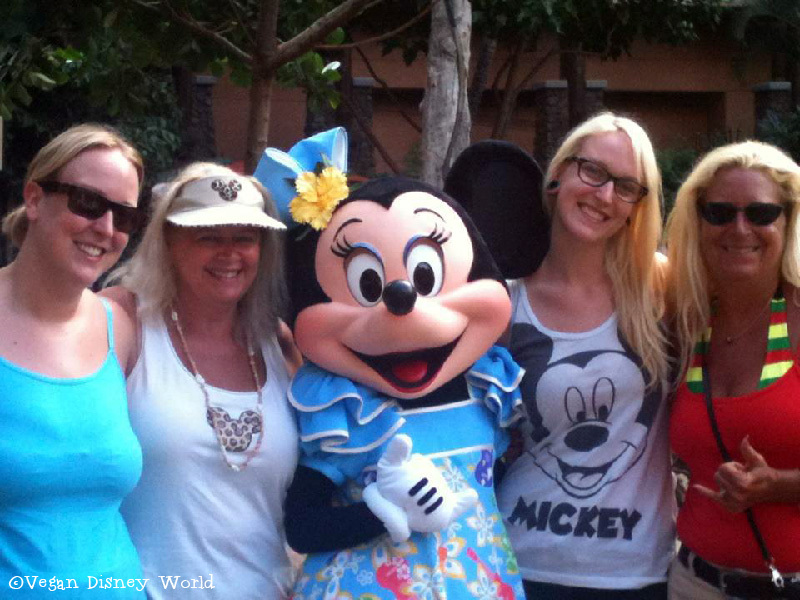 In November 2012 I (Melissa) went with my family to enjoy a few days in paradise with board shorts Mickey and friends. Aulani sits roughly 20 minutes west of the Honolulu airport on the “dry side” of the island. It is tucked away with a private beach and is neighbored with 2 other resorts. The resort is huge, two large towers with rooms, multiple places to eat and drink and a whole separate adult only area. From Aulani you can do several excursions to see the island from land or sea. 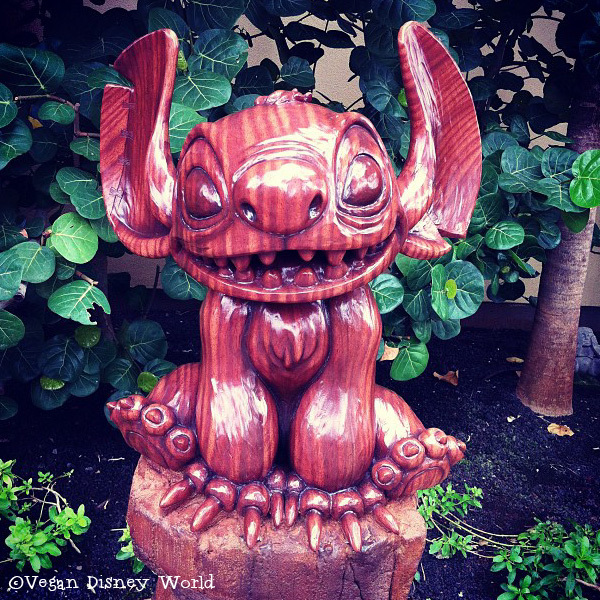 Aulani was a beautiful resort, there was plant life everywhere and lots of hidden Menehune’s. Menehune’s are from ancient South Pacific folklore that are tiny elf-like creatures who become frozen statues during the day and become mischievous during the night. There are tons of them throughout the property which gives you even more to look at while you’re there, as well as plenty of hidden Mickey’s. There is a private beach for Aulani guests, a large pool, lazy river and two infinity hot tubs, perfect for watching the sunset. You can even swim in an aquarium with fish, I would rather snorkel out in the open water but I’m sure others would like the feeling of safety this brings. Aulani has two main restaurants, ‘Ama’Ama and Malahiki, a quick service at the pool and two bars that offer appetizer style meals. ‘Ama’Ama is set back by the beach and offers beautiful evening views of the sunset. I wasn’t sure what kind of vegan options I would be able to get on this trip, so I went in with a completely open mind and was willing to eat anything at this point. We ate at ‘Ama’Ama for lunch when we first arrived and I was able to speak to a chef about my diet. He told me I could get a vegan version of the Char-grilled Vegetable Sandwich on Focaccia which typically comes with Basil Aioli. My sandwich came with zucchini, portobello, eggplant, red pepper, onion and spinach and was sautéed in balsamic vinegar to replace the aioli. I also had fries as a side with my sandwich. This appeared to be the only vegan offering at this restaurant, so luckily it was really good! After dinner there is plenty to do at Aulani from Hawaiian shows, fires, movies and two fun bars. The Olelo Room offers small plates and the whole bar is covered in common words and objects that are written in both English and Hawaiian. The other bar is outside near the pool, Off The Hook, features more of a restaurant menu. There appears to now be Soy-Marinated Tofu Lettuce Wraps which I would hope be vegan but can not confirm as these were not there when I went in 2012. My parents and I stopped at both bars during our stay and I really enjoyed Off The Hook since we could sit in an open air bar and enjoy the Hawaiian warmth. There are two options for breakfast at Aulani, you can do the character buffet at Malahiki or a table service breakfast at ‘Ama’Ama. We opted for the character breakfast at Malahiki. It is not a quiet breakfast, we ended up moving to outside seating because of the noise, grumpy dad wasn’t enjoying Aunty’s singing and children banging on pans. 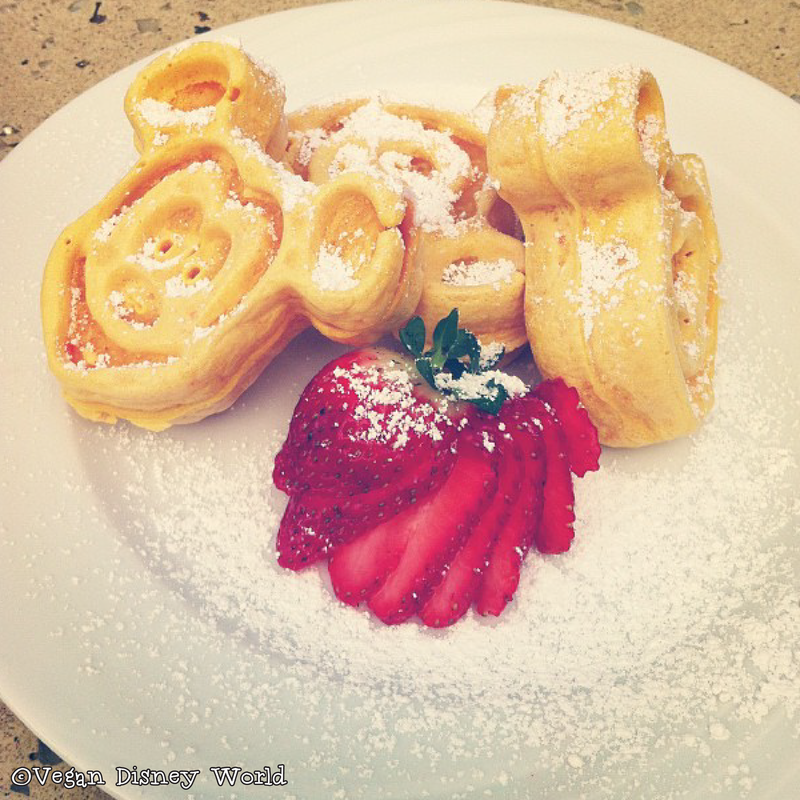 I was able to speak to a chef about my vegan diet and he said he would make me vegan Mickey waffles, which made me very happy! I was surprised that I could get them in Hawaii too. He asked if I wanted maple or coconut syrup, I naturally opted for coconut since I had never had it before and I am now obsessed. The chef also walked me around the buffet to show me what I could eat. 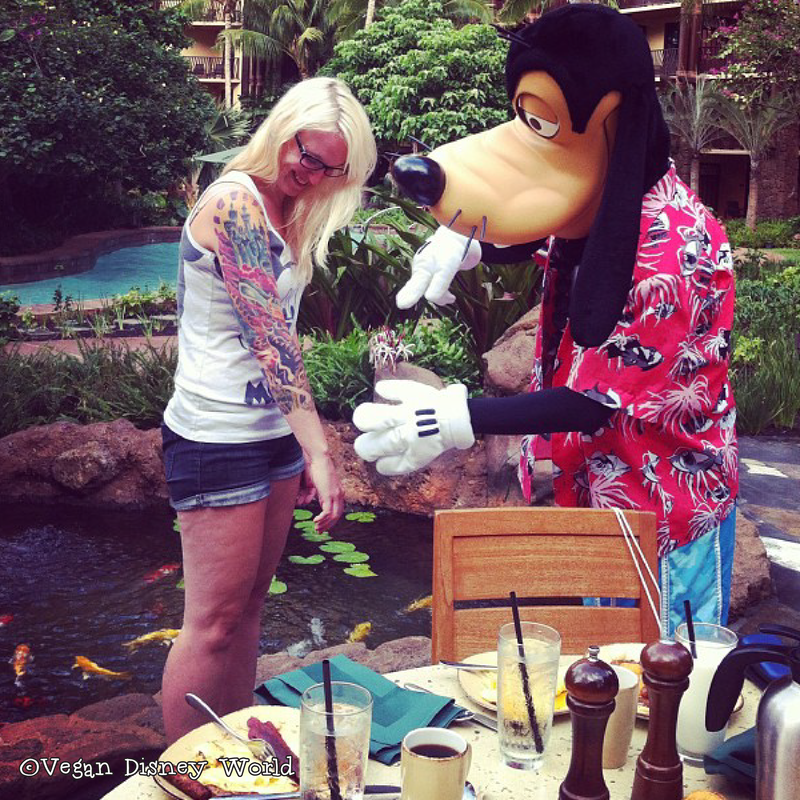 The buffet at Aulani was much different then one in Disney World. Since there is a large Japanese influence on the island much of the buffet was typical of a Japanese breakfast. I was able to eat potatoes, lots of fresh fruit, steamed rice and miso soup, yes miso soup. On the buffet they made fresh omelets, pancakes and waffles as well, for your omni loved ones. We were seated outside next to all the Koi ponds which they began feeding while we were out there. The fish began jumping out the water to eat and it was a fun experience. If you come here for breakfast ask to be seated outside for the fish and the lack of noise. The characters made their way to each table in typical Disney fashion. Mickey and the gang came around for pictures and autographs. We were only at Aulani for a few days and the food situation was definitely not ideal. Since there was only two main restaurants the food selections were pretty slim. We went back to Malahiki for dinner where there wasn’t a single vegan-like item on the menu. The chef came out to talk to me and said he was excited to try to make me something different. He made me a plate or risotto and lots of veggies, brussels sprouts, asparagus and many more. It was pretty tasty for him just throwing it together but not something that I would come back for. The resort was great, the food was pretty good and the Disney vibe was strong. If you are planning on coming here I suggest renting a car. We ate at Malahiki twice for breakfast, ‘Ama’Ama twice for lunch and Malahiki once for dinner. When you can only eat one thing at each restaurant there isn’t a huge variety. We were there for Thanksgiving and in our effort to find something else to eat that night my aunt and I found an all vegetarian grocery store. This is worth checking out if you go to get some grab and go food or something to change it up from just eating waffles and vegetable sandwiches!